Fasting form: reduced carbohydrate intake results in systemic mobilization of fat stores. Circulatory form: compression of the aorta causes a reduction in arterial flow to abdominal organs. Incidence: Incidence of pregnancy toxemia is moderate. Obese animals appear to be at higher risk of developing pregnancy toxemia compared to lean animals. Clinical Signs: The syndrome usually starts during the last two weeks of gestation. When not immediately fatal, clinical signs may include depression, lassitude, anorexia, dyspnea, convulsions, and stillbirths. The urine becomes clear, has a pH of 5 to 6, and contains high levels of ketone and protein. Hematologic abnormalities consist of hypocalcemia, hyperphosphatemia, elevated BUN, and hypoglycemia. 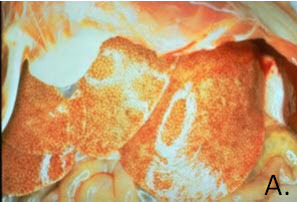 Pathology: On necropsy, the stomach is empty, the liver (A.) and kidneys are quite fatty, the uterus may contain near-term fetae along with varying amounts of hemorrhage, and ample fat stores are visible throughout the abdomen. Diagnosis: Diagnosis is based upon history, clinical signs, urinalysis, and necropsy.